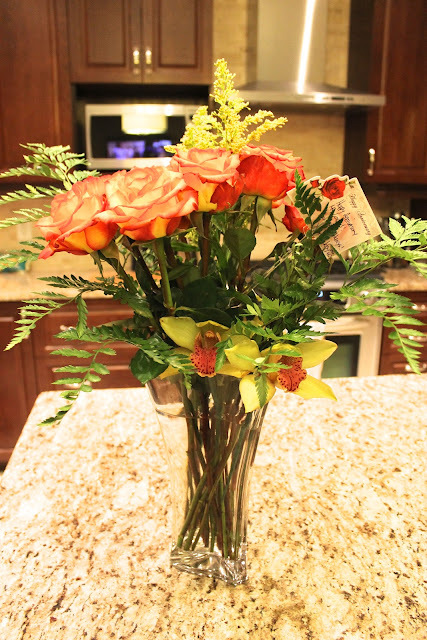 As you all may know, Wednesday, September 19, was my 3 year wedding anniversary and my wonderfully amazing husband surprised me with a beautiful bouquet of yellowy-red roses and 3 orchids. My wedding bouquet was ivory roses and green orchids, and on our anniversary he makes a point of adding one more green orchid to a bouquet of flowers. How lucky am I? Aren't the flowers beautiful? I really love the two-toned colours too - very fall! He also surprised me with tickets to see the Beauty and the Beast musical when it comes here at the end of October. Again - luckiest girl right here! What do your hubbies do for you that's special on your anniversary? Have any of you see the Beauty and the Beast musical? I'm very excited to see it, and oh so blessed to have such an amazing man in my life!